In my first two blogposts of this series, I took a look at a couple of things. First, I took a look at where the Green Party has come from regarding its recent internal struggles to “mainstream” the Party in order to experience more electoral success. And second, I looked at how this movement to mainstream the Party has meant that the grassroots, ignored for too long, can no longer be ignored if the Party is to experience continuing success. In my last post, I argued that applying our scarce resources to prioritized geographically-grouped ridings in B.C. and southwestern Ontario might be the most sensible approach for our Party to take to achieve electoral success in 2015. In this post, I’m going to look at what our Party can be doing on the national political scene to better improve our chances for electoral success. I sincerely believe that the Green Party risks being squeezed out by the NDP over the coming years, and that if we are to experience success, we must present our Party as one in opposition to the ideas advanced by the New Democrats. We must also be ready to seize and exploit any and all opportunities which might come our way. With an increasingly-streamlined decision-making process in place, our Party has been preparing the way for providing more nimble and timely responses, but much work remains to be done. I’ll be looking at the Party’s structure in my fourth blogpost. As in any parliamentary session, we can expect that there will likely be several by-elections occurring in the upcoming 4 years. The Green Party must be ready to seize the opportunities presented to us by these by-elections. That only makes sense, but what does it really mean? First off, our spectacular failure in the by-elections of 2010 needs to be noted, especially the by-elections in Vaughan and Winnipeg North, which were two ridings where we should have performed much better than we did. Instead, the results were dreadful and dismal. What happened? Well, first off, there was no prioritization of these by-elections within the Party. Actually, the impression from here in Sudbury was that the Party simply was not trying, likely as a result of pursuing other initiatives (such as getting Elizabeth May elected in SGI). The Green campaigns in the by-elections were largely left in the hands of local candidates, who performed well under the circumstances. But a lack of Central Party support (whether merited or not) meant that our results were terrible. In the future, the Party must be prepared to go all-in on key by-elections. Note that I’m not suggesting that we do so for all by-elections, as frankly some by-elections are likely to be in ridings where we just don’t have much of a chance. Being prepared means having credible candidates nominated in advance of by-elections. 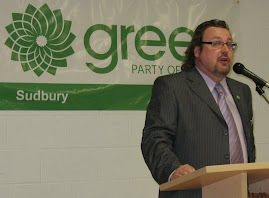 Yesterday, I argued that the Green Party should target the end of summer 2012 for having a full slate of candidates nominated for the 2015 election, and I presented my observations as to why I thought that was a good idea (time to build a local profile on the ground, through media and social media; opportunities for fund-raising, etc.). In those ridings where we expect and know by-elections will happen, it’s absolutely imperative that candidates be selected as far in advance of the by-election as possible. For targeted ridings, our Leader must be available to visit. Often. We must also get the Central Party apparatus on board, and do what we can to flood the riding with volunteers. We’ve done this before, most notably in Guelph (which we might have won back in 2008, ‘cept for Harper’s general election call just days before voters went to the polls there). Other EDA’s must be ready to lend volunteers to by-election efforts (which can be educational experiences for new volunteers wanting to get their feet wet in election campaigns, and thus bringing transferable skills back to the EDA). EDA’s probably should be encouraged to make a financial commitment to volunteers loaned out for by-elections. By that I mean EDA’s should help with room and board of loaned volunteers, and recognize this expense as helping the Party and ultimately the EDA. By-elections may yet prove to be a good way of growing our caucus. We must be prepared to capitalize on these opportunities when they arise. Although I am predicting that parliament is going to be the most polarized Canada has ever seen, there still may be some opportunities for the Green Party to pick up parliamentarians who have, for whatever reason, decided to leave the Party under which they were elected to Parliament. In all honesty, I can’t identify a single MP at this point who might find themselves in this circumstance. But, with the Liberals and the Bloc both having to go through Leadership contests in the next 4 years, there may be opportunities down the road to pick up disenchanted supporters of failed leadership candidates. The idea of floor-crossers joining our Party isn’t a popular one. Generally, a floor-crosser is derided in the media, and often not popular within the new Party either, due to ideological uncertainty. Some have succeeded very well, however, such as Scott Brison and Belinda Stronach, who left the Conservatives for the Liberals. Both were red-tories anyway, and didn’t feel at home in the new, ultra-right wing Reform Conservative Party. Both were let off the hook by the media fairly easily for their move (well, Stronach was savaged because she was a woman, that’s for sure). Our Party has already set the bar pretty low for excepting floor crossers. Blair Wilson, who joined us back in 2008, was hardly star material. But…well, at least he had been elected. I had advocated in the past that the Party try to go after Garth Turner after the Conservatives kicked him out their caucus (and before he decided to retire from politics). Anyway, there may be some opportunities for the Party to approach disgruntled or ejected MP’s. We need to be on the look out for these opportunities, and we need not be too discriminating, either. In politics, ideology can be…malleable. Growing our caucus through by-elections and MP poaching, however, will put us in much better standing come the 2015 election. Ask a Green which Party poses the biggest threat to the success of the Green Party, and you’re likely to receive an emphatic response: The Conservatives! Of course, the Conservative Party of Canada does pose the biggest threat to the kind of Canada that most Greens want and advocate for. The anti-environment, anti-democratic policies and practices of the Conservatives stand in direct contradiction to just about everything that the Green Party stands for. In a very real way, what the new false majority Conservative government is likely to implement in terms of eliminating the per-vote subsidy, selling off the CBC to corporatist media barons, and instituting guidelines for national televised debates which would keep the Bloc and the Greens out in 2015, is very likely to constitute significant threats to our Party. None of these situations are within our ability to control however. We can crow as loudly as want to about how the removal of the per-vote subsidy is a blow to our democracy. It won’t matter. It’s still going to happen. We must find our own way forward towards success within this reality. Crowing about it isn’t going to help (although crow we and others must, because it is an injustice and insult to the democratic health of our nation). Of course, the other parties are going to be doing the same thing with their own version of the Conservative bogeyman. And they will be more successful in getting their own messages out, because they are larger parties and are better funded than we are, and they are more well-respected by the media. Our Green voices will continue to be drowned out by others. Don’t misunderstand me: our message may be superior, but if we lack the ability to communicate it, superiority won’t matter. We witnessed this in the past election, and lost popular vote-share as a result. The Party which poses the biggest threat to the success of the Green Party is the New Democratic Party. The media has branded the NDP as the progressive voice of Canadians, to the point that the NDP was able to slay left-leaning Liberals and Bloc supporters. The NDP now sits unopposed as being the moral voice of Canada’s left. Try as we might to instill the notion that the environment isn’t a partisan issue, in the eyes of the media, it is. If you advocate carbon-pricing to fight climate change, you’re a lefty socialist. If you want to continue providing subsidies for renewable energy projects, you’re a lefty (even if your name is Dalton McGuinty or Dwight Duncan). If you believe that climate change is an international socialist scheme to redistribute wealth, well you’re on the right (both politically, and increasingly in the eyes of the media, morally). Greens need to be prepared to answer to the perception of the environment being a left-wing issue. Our response must be then to assert ourselves and our policies as being different and preferred to those on offer by the left wing of Canadian politics, meaning the NDP. This isn’t going to be an easy task, given the inherent association of environmental issues as within the realm of ownership of the left, again meaning the NDP. The Green Party can try to reclaim ownership of progressive, environmentally-conscious vote-share in one of two ways. First, we could decide to move further to the left than the NDP. This might at first glance seem like a good way of recapturing the progressive vote which appears to have abandoned us. We know that the NDP’s environmental policies are weak and contradictory. Surely we will discovered disgruntled former supporters flocking back to us if we present ourselves as Canada’s most progressive party. The problem with this approach, however, is getting the message out. And frankly, being believable with that message. We keep hearing about how the Liberals, in an attempt to capture left-wing support in the last election, failed to do so because their supporters figured why bother voting for the NDP-lite Liberal Party, and instead opted to vote for the real thing (especially given that the NDP’s platform was the most centrist it’s ever been). And let’s not forget that the NDP will be commanding significantly more media exposure, as a result of becoming the Official Opposition. A leftward path for the Green Party will be, in my opinion, a path towards abject failure and obscurity. A second approach worth considering is to identify the Green Party as a viable alternative to the NDP, one not bogged down by socialist ideology which continues to commit to union-dominated, brown-economy ways of thinking. This approach will inherently mean that the Green Party might have to move towards the right of the political spectrum, and that we continue to focus even more strongly on economic issues. By moving right-ward, we will occupy a more centrist position. The rightward move can’t be helped if we are to set ourselves up in opposition to the NDP. And I believe that we absolutely must do so. The NDP are not our friends. They may be allies on certain issues, but at the end of the day, they are our opponents, and they are offering Canadians a version of Canada which might be better than the one being offered by Conservatives, but it’s still very problematic. Arguably, from an economic standpoint, the NDP’s Canada is a perilous place indeed. That’s not to say that we can’t work with them. It is to say that we can not lose sight of the fact that the NDP would gladly see the Green Party self-destruct over the next 4 years. Clearly, from an NDP perspective, a rising Green Party poses a long term threat. They know it. Do we know it enough to focus on the NDP as the greatest risk to our success? I’m not advocating in engaging in the politics of mudslinging and negativism when I say that we need to focus our efforts in setting up the Green Party as an alternative to the NDP. I am instead suggesting that the limited messaging that the media allows us to convey to Canadians needs to shift its focus away from the Conservatives and towards the NDP. It may seem that we’ll be bashing an opposition party which can’t influence government. But if we do it right, what this approach will prove to be is representing the Green Party as a studied contrast to the reactionary and contrary attacks of the NDP on the Conservatives, while simultaneously pointing out that the NDP isn’t wearing any clothes. We’re in parliament now. Let me provide an example of how our messaging can change. Take Bill C-311, the Climate Change Accountability Act, passed by the last parliament and killed in the Senate. At the time the Bill was being debated in parliament, our Leader came out in support of its passage. This NDP private member’s bill would have committed Canada to achieving certain targets for reducing greenhouse gas emissions by certain milestone dates. But it didn’t provide any mechanisms for actually reducing emissions. It just established dates which required the government to work towards, while putting off the much more difficult questions regarding how to get there. Yes, absolutely Bill C-311 was much better than anything else we’ve had in terms of keeping climate change on the public agenda, and yes I think it was wise of the Party to support the bill’s passage in the last parliament. In this parliament, however, the Green Party will need to take a much more critical and studied approach to proposed legislation such as Bill C-311. First of all, we’ll be able to do so, because anything proposed by the NDP isn’t going anywhere anyway in the next parliament (so there’s really no risk of scuttling half-good bills). Secondly, we gain by being seen to offer a more studious, reflective and solid approach to the issues brought forward by the NDP in a knee-jerk, half-baked kind of way. Those kinds of discussion in front of the media will lend legitimacy to Greens in the eyes of Canadians (and the media), and will assist in differentiating ourselves from the NDP. And they’re the sorts of discussions that we should be having anyway. My point, however, is that our focus throughout the next four years should not be on being critical of the Conservative Party; it must be on the NDP, as that party represents the biggest impediment to our future success. Currently, our Party is committed to carbon pricing by establishing a carbon tax, and a cap and trade emissions trading market for large emitters. We have traditionally played up the carbon tax over cap and trade for several reasons, but primarily because it is a far more sensible and business-friendly approach to carbon pricing. Cap and trade, though, has remained a fixture behind the scenes within our Party because it used to appear that this would be the preferred method of carbon pricing which the Americans were going to pursue. Well, guess what? Cap and Trade is a dead issue in the United States. Obama is reluctant to mention that climate change is even happening, and recently the U.S. Congress voted that the jury is still out on climate change, which means that the U.S. government need not worry about doing anything about it just right now. The latest buzz for climate pricing coming out of the U.S. is the growing movement to use James Hansen’s “fee and dividend” approach. Fee and dividend would put a direct tax (or premium, if you prefer) on carbon-rich goods and services. The profits raised by the government through the imposition of this fee would then be returned to Americans by directly cutting them a cheque. With more money in their pockets, the theory goes that Americans will then likely begin choosing goods and services which are less carbon-rich. Sound familiar? That’s our carbon tax policy (except that our policy wouldn’t directly cut a cheque for Canadians; instead, we’d pay Canadians back through reductions in income taxes, and provide relief to the poorest amongst us through a guaranteed livable income. This approach is, in my opinion, superior to Hansen’s, as his cheque would go out equally to everyone (a “flat” approach), while we can utilize the income tax system to provide more relief to the middle class, and target those who really need it through GAI. Our approach is also superior to the NDP’s desire to put revenues from carbon pricing into social programs, as Canadians require real insulation from rising prices. That must mean more money in our pockets with which to make smarter choices). When the topic of carbon pricing is discussed in the next four years (and it will be, although not as much as we’d like it to be), the Green Party needs to be able to clearly differentiate ourselves from both the Liberals and the NDP (and the Bloc too, for that matter). We’re the only Party talking about a sensible and predictable small-business friendly approach to carbon pricing. We need to get that message out. That means that we can’t muddy the waters by weekly claiming to support Cap and Trade, along with the NDP. We must present ourselves in contrast to the NDP’s policies. Not just because it’s politically smart for us to do so, but because cap and trade is far less “smart” than a carbon tax. I believe that our future success relies on the Green Party establishing itself in opposition to the NDP. One of the best ways of doing so is to continue to hammer away at the NDP’s cap and trade scheme. When and should the NDP abandon cap and trade, we’ll be able to claim a moral victory. But I don’t expect the NDP to let go of cap and trade any time soon. But the Green Party must. The Liberal Party might pose a big challenge to the future success of the Green Party, but it might also create certain opportunities. With a small caucus in place, occupying the reduced centre of the Canadian political landscape, the Liberals are sure to be enthusiastic about re-growing their base. However, given that the Liberals have been prone to make one or two mis-steps lately, we Greens need to opportunistically eye what’s going on with the Liberals over the next four years. This doesn’t mean that we need to attack the Liberals. On the contrary, I believe that it’s in our interests to consider the Liberals to be our Party’s best ally in parliament. Largely because they’re in the closest situation to our own. Consider that the Liberal Party is no friend of either the Conservatives or the NDP, both of whom they’ve just lost vote share to. They, like the Greens, are going to be squeezed out of the discussions (and media coverage) in this coming polarized parliament. What media coverage they receive is going to almost be entirely focussed on their own internal issues, and not the ideas or policies which they may advance (not that there are likely to be many of those for the first little while). I believe that the Liberals, in an attempt to re-invent themselves, will be looking for a much bolder vision on which to fight the 2015 election. In casting around for the next “big idea”, they are sure to land on the environment and climate change. Sure, they were there before with Stephane Dion (and look how that turned out for them), but what about similar, compelling ideas brought to you by Justin Trudeau, or even Bob Rae? Wherever the Liberals go, they’ll be setting themselves up in a contrary position to the Conservatives and the NDP. In fact, they are likely to zero in on the NDP as the bigger threat, given that the Liberals first goal must be to recapture Official Opposition status, rather than go straight from 34 MP’s to government. The Liberals know that the NDP support in the last election was “soft”. With our tiny caucus of one, and our shrunken share of the popular vote, the Green Party really isn’t a threat to the Liberal Party, unless we do the right things over the next four years: grow our caucus, score some points on the NDP, receive more media coverage, organize in local priority ridings, and proving to all that we can be a serious player on the national stage, if a small one. Even in those circumstances, our threat to the Liberal Party will only likely be felt in certain ridings (such as Guelph and Vancouver Centre, maybe one or two more). What if in 2015 we decided to not oppose progressive Liberals in certain ridings which they wish to hold or expand into, in exchange for their agreement to stand back and let the Greens give things a shot in a few ridings, just as Dion and May did back in 2008? Think about it: if we were to step back from Guelph and Vancouver Centre, along with a number of other ridings (maybe in Quebec or Northern Ontario), maybe the Liberals would cede opportunities for us in Calgary, or better, on Vancouver Island. Since we should be looking at a small number of regional priority ridings anyway (especially in B.C. ), and with the per-vote subsidy eliminated, it may be very advantageous for us to work with the Liberals in 2015 in some sort of non-compete deal. But that’s only if the Liberals end up chasing a more progressive agenda than they did under Michael Ignatieff. Frankly, Ignatieff’s policies were anathema to Greens. But in 4 years time, we’re likely to have a better idea of a where a reinvigorated Liberal Party is coming from. Given all of the focus on the idea that our electoral system is somehow “broken”, I fully expect that Stephen Harper and the Conservatives will strike some sort of blue-ribbon task force to look at ways of fixing it. Rather than hitting on real ideas like instituting proportional representation, however, no doubt the suggestions brought forward will be to add more ridings in places like Ontario and Alberta (which is probably a good thing, given population changes, but ultimately likely assisting the Conservatives more than any other party), removing the per-vote subsidy, and providing guidelines for the televised Leader’s debate (maybe they’ll move to re-institute corporate donations to political parties as well). It’s in Harper’s interest to limit the media exposure of his national party leader opponents in the 2015 election, and the Broadcast Consortium would be a great and timely target for him to take on, thanks in part to the Green Party having kicked up such a fuss recently. Handing down clear rules for the Consortium to follow (or at least a “guideline”) regarding who gets invited to the debate would finally put to rest the controversies which have dogged our recent elections. So, in Harper’s world, who would get an invite, and who wouldn’t? To me, it only makes sense that the Conservatives would advocate that only the serious contenders be given a platform. Too many candidates speaking at once is unworkable, and frankly won’t help the Canadian electorate make up their mind about which leader to vote for (hey, I’m in Harper’s world for a moment…allow me some license here). That means only political parties which are established political parties in the House of Commons will be allowed to participate in the debates. And that means only those parties which have 12 or more seats. This position would work well if Harper decides he’s written off Quebec, because it would eliminate the Bloc from participating in the debates, which would create a significant amount of backlash). The NDP could likely support this approach, because they would also benefit from sidelining the Bloc (and they would have the added benefit of being seen to oppose it in the House and in the media, so as to avoid the backlash being focussed against them, secure in the knowledge that their opposition won’t change a thing). While the Green Party won’t be the specific target in this circumstance, we’ll be impacted by association. Will Canadians stand for it? Well, a majority of Canadians opposed the exclusion of Elizabeth May from the debates in the recent campaign (around 60%). And that was before the Greens had a seat in the House. Having a seat in the House is largely the perceived threshold for an invitation to the debate (although even with a seat in 2008, the Consortium initially denied May the chance to participate). So we can expect Canadians to be up in arms over the Green Party’s exclusion. But this is likely to be tempered by the notion that the separatist Bloc Quebecois will also be excluded, and we won’t have to listen to this “treasonous” regional Party spout its nonsense to a tiny audience during the English language debate. No, the response from Canadians will be muted, largely because the decision will be made at time when an election is far from the minds of most Canadians. And because the Bloc will get the shaft. You heard it here first, Canada: Elizabeth May will not be in the next televised Leader’s debates. In my next blogpost, I’ll expand on the notion that the Green Party needs to continue along the path of mainstreaming that we’ve been on for a while now, by looking at some of the structural and policy related things which the Party can do. However, action within the Party itself only takes place at a slow pace (and then, all at once…and then…nothing). Outside of the Party structure, though, there are things which Elizabeth May can do to create the perception of an increasingly mainstreaming party in the eyes the media and voters. First of all, I have to say that May has been doing an excellent job of this anyway. Despite losing vote share, May has publicly stayed on message that the Green Party isn’t a one-issue fringe party. She has articulated the policy and program initiatives of our Party to the public in an easily understood manner, while at the same time coming across as a committed activist politician and (perhaps more importantly) intellectual heavy-weight. And she’s done so while simultaneously assuming the mantle of significant moral authority. When the public thinks of Elizabeth May, that’s often the image the general public has in mind (coupled with the notion that maybe she’s in the wrong party; or that she’s simply just a maniac who doesn’t get it…but the voters who hold that view were never going to come her way anyway). May needs to continue to do what she has been doing well. Her recent comments and criticism over the oil spill in Alberta have been bang-on, and although they’ve been receiving no attention in the mainstream media, at some point they may achieve a breakthrough of critical mass. And even if they don’t, she’s been right to be critical, and being right continues to build moral authority. The mainstreaming of our Party relies in part on May’s continuing to assume the mantle of moral authority on a small range of issues, with the environment being the most important, closely followed by the democratic deficit. These are core Green issues, but we lost votes to other parties recently (the NDP) who have presented watered-down sound-bite solutions for these issues. As much as we might want to try to expand the issues on which May can assume moral authority into such areas as health care and the economy, it’s not going to happen. With limited resources, Greens need to recognize that it’s just not going to be in the cards for the media and voters to turn to May to offer up her opinion on corporate taxation or health care. That doesn’t mean that May and the Greens should abandon those issues. Far from it. But it does mean that our strategy for putting the party in front of the eyes of Canadians should not include to any significant degree the issues on which other parties are likely to maintain their moral ownership of. Look, we know where we shine, and we know what we do best. Let’s focus the limited public attention that May is going to get on those things. And maybe one other issue, which I believe we can and should take ownership of. In the past election, I was very troubled by the fact that so many marijuana activists went over to the NDP, given that our policy to legalize marijuana was far superior to Layton’s waffling, inarticulate and confused ramblings. I by no means am in favour of marijuana, but I chafe at the economic damage that prohibition has brought to Canada. If May were to take moral ownership of the marijuana issue, I believe that Greens gain in several respects. First, it insinuates us into economic discussions, as our support of legalizing marijuana stems in large part from a very valid economic argument (along with a pro-peace value, given that the War on Drugs has been a violent and abysmal failure). Secondly, it may be a wedge issue for a small minority of voters, but couple with our sustained offensive against the NDP, it may be enough to pry some (very well organized) supporters away from that party. Some might believe that a pro-marijuana stance isn’t a mainstream idea. That might have been so at one time, but no longer. Ending marijuana prohibition has been front and centre in the mainstream media for several years now, and will increasingly be so over the next four. This is one issue that Greens, who have always been out in front on, need to embrace. And finally…we need to do more to brand our Party. I’m not just talking about slogans and logos (although I’m also talking about that). Branding involves a concerted commitment to staying focussed and on track with regards to everything from message delivery to visual appearance. We’ve been getting better at branding, even with the undercurrent against this within our own Party (it’s not easy for those opposed to corporatism to embrace Madison Avenue-style marketing, you know!). We actually have a decently recognizable brand on offer already. And the name of our Party is helpful in promotion. Some have said that Green Party name is also a hindrance, as the word “green” has only an environmental focus. That may be true, but again I would suggest that it only makes sense for the Party to focus its limited resources on those things which we do well, so in this case, being “Green” is easy for us. Our Party logo though…I don’t know that the stylized sunflower truly resonates with anyone. Given that conversations around the need for action on climate change are bound to enter into the moral and patriotic areas in the next few years, I believe that our Party might want to get out in front of this through branding. A green maple leaf just makes more sense. Either in conjunction with the sunflower or, better yet, on its own. We saw those green maple leafs floating down into ballot boxes in our recent advertising. That’s what we need more of. The Green Party’s brand itself needs to become more patriotic, appealing directly to Canadians as Canadians. The Conservatives have experienced significant success with this approach. Do you remember the commercial they released near the end of the campaign, where a triumphant Stephen Harper voice over cascaded through a microphone, imposed on patriotic “Canadian” images of mountains and hockey players and families? Sure, that ad seemed a lot like a beer commercial…but what could be more Canadian than a good beer commercial trumpeting what it means to be Canadian? Ultimately, having our Party brand associated more with Canada in the minds of voters just can’t be a bad thing. It’s something that we should work on. I to would like to see our brand more become more Canadian, I think the green maple leaf is a good image to foster, we should incorporate the leaf through to next election and then phase out the flower by the 10 year mark. Press releases by the party are far too often "the GPC supports the poor oppressed_______ from _______ in their struggle with/for/over________"
We need to focus on and pander to Canadian issues and lessen the press releases that get dropped in the "I don't give a damn" file. We need to do this not because it's correct to look only inward but it's what's important to Canadians and it's what sells. There have been a number of instances when important business in the HoC was ignored while the one press release for the weak talked about an external issue, this is not the way to become relevant to Canadians. Policy wise we need to pound financial issues, both to make us more credible but also because this is the main NDP weakness. I agree, I'd love to see cap and trade discarded on the grounds we don't need another commodity to be gamed by Bay street. Clear differentiation from the dippers on the issue is an added bonus. I don't have a lot of faith that most Canadians are altruistic enough to support fair trade for the good of outsiders, we need to play some of these trade issues from a more Canadian self interest angle, more jobs, better jobs, and relocalization so we are not dependent on world supplier bottlenecks like the Auto industry is suffering because of Japan. A focused campaign on pot advocates "GREENS for the Green" would be a great idea. Direct mail, outreach and focused adds in the hydroponic, grow your own magazines. It shouldn't be too costly. Identifying other organized niche groups with possible synergies is certainly worth some investigation. I'd love to see some message training for Green members, nothing quite so robotic as Conservative talking points but developed conversation strategies for dealing with objections and questions. Overall we need to expand our commentary to encompass all 6 core values rather than just the environment. With that in mind we need to build a pool of letter writers and online comment makers to keep the green perspective on issues in both the local and national media. Fair vote Canada has done this well informing members of relevant articles that need fact checking and spin control. We need a larger focus on youth members, local recruiting, campus clubs, policy input.